There was great excitement at Lucky18Casino.com yesterday as staff watched their Jackpot Pinata progressive jackpot reach and surpass one million dollars for the first time ever. 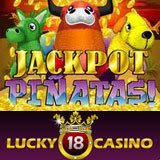 Jackpot Pinata is now the largest progressive jackpot offered by online casinos that accept U.S. players. Jackpot Pinata is a twenty-line online slot machine with tacos, beautiful señoritas, fresh limes, roses and various piñatas on its reels. Its free spins, wild symbols, substitutes, and bonus game make game a veritable fiesta. It takes five Bull Pinata symbols on any one of the paylines to win the progressive jackpot. To qualify for the jackpot, players must wager $0.25 per payline. Launched just a year ago with an initial $250,000 prize, Jackpot Pinata was hit for $273,914 within weeks but hasn’t been hit since. Jackpot Pinata isn’t the only game currently poised to make some lucky jackpot winner rich. The Midlife Crisis/Shopping Spree jackpot at Lucky18Casino.com is also getting close to a million dollars, currently at about $905,000. For those that prefer jackpots that are hit more often but for lesser amounts, Lucky18Casino.com offers Let ‘Em Ride which is hit, on average, every 17 days. The last hit was for $41,014 and that was a week ago already. Lucky18Casino.com online casino offers hundreds of slot machines as well as blackjack, craps and roulette. Their massive $1800 Welcome Bonus offer is the most generous deposit bonus anywhere. Powered by Realtime Gaming, Lucky18Casino.com welcomes players from around the world, including the U.S.